Give More Hope... and Volunteer at FVHH! 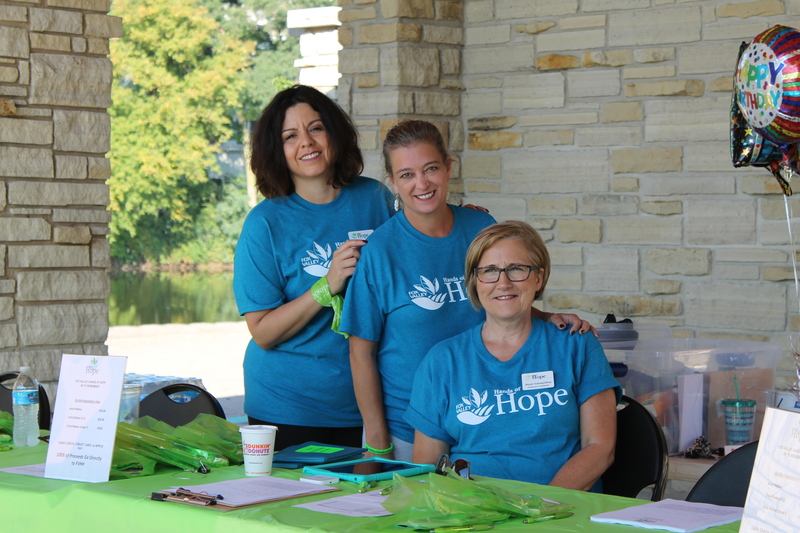 Volunteers are a vibrant and essential force within Fox Valley Hands of Hope. Opportunities include patient and family care, bereavement one-on-one support, support group facilitation, Spanish language interpretation services, community outreach and ambassadorship, fundraising and event support, office administration support, and even gardening! Our ambassadors educate local churches, clubs and companies about our organization through speaking engagements. Ambassadors also represent Fox Valley Hands of Hope at a number of community and special events. Our bakers bake bread for bereaved individuals and/or cookies for supportive care clients. Our volunteers are trained to provide individual emotional support to grieving adults in the community. Our facilitators are trained to lead support groups for children who have suffered a loss of life or who are experiencing anticipatory grief. Our clerical support volunteers spend time at the Fox Valley Hands of Hope facilities in Geneva completing a range of duties including answering phones, data entry, typing, photocopying and assembling packets. Special projects are also available at times. Our bilingual volunteers are taught to reach out to the community through correspondence and presentations to area clubs, churches and organizations. Our volunteers help maintain the Fox Valley Hands of Hope facilities in Geneva by weeding, pruning and watering, as well as quarterly landscaping. Bilingual individuals are trained to provide interpretation during training and support groups. Our volunteers deliver gifts or food items at special times of the year. Our patient and family care volunteers often serve as catalysts for the patient and families, listening and then encouraging the family to finish unfinished business, to heal old wounds in relationships and to prepare the family for life without the dying person. Volunteers often provide respite care to allow the primary caregiver to rest or take a social break. A required 18-hour training course is provided. Professional individuals such as hairstylists, manicurists, massage therapists, chaplains and music/art therapists assist patients in their homes. To participate, professionals must be credentialed and must provide their services at no charge. Training may be required. Volunteers who can sew are asked to make “Hug Pillows” and teddy bears for the children of the supportive care patients/residents and for Herbie’s Friends participants. Other various sewing projects may arise as well. Volunteers are needed to assist with Fox Valley Hands of Hope’s annual Garden Party luncheon. Committee members are involved in obtaining prizes and centerpiece decorations, selling raffle tickets and much more..
Our volunteers provide support to the Supportive Care residents and their families through companionship in a caring, encouraging and respectful way. Fox Valley Hands of Hope volunteers will be assigned to help with resident activities or to provide one-on-one companionship. Our support group aides and facilitators help with or lead discussions within our various groups. They also help nurture those involved and are available as a resource person. Bereavement training is provided and required. Bilingual volunteers are needed to translate written material from English to Spanish.